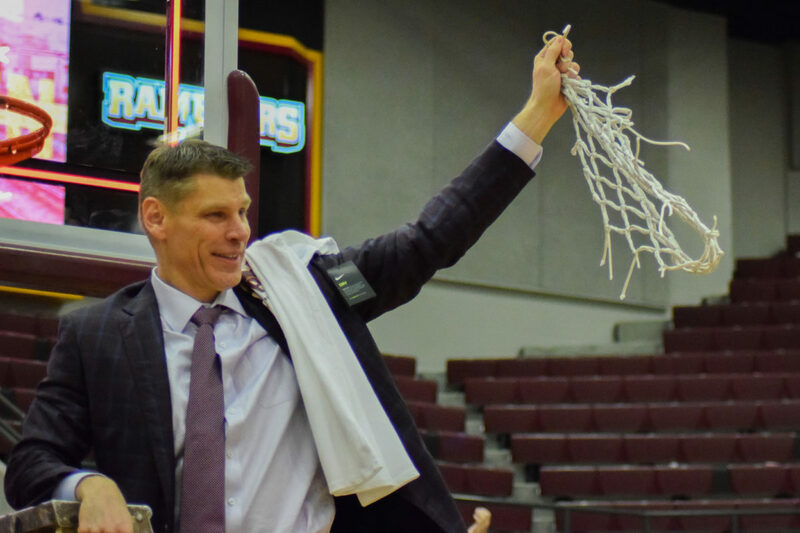 Nick Schultz | The Phoenix Loyola men's basketball head coach Porter Moser cuts down the net after Loyola locked up another MVC title. 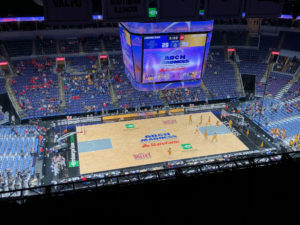 Kicking off March 7 at the Enterprise Center in St. Louis, the Missouri Valley Conference (MVC) tournament — known as “Arch Madness” — will decide the winner of the conference’s automatic bid to this year’s NCAA Tournament. After winning the MVC regular season title and conference tournament last season, the Loyola men’s basketball team (19-12, 12-6) returns as the tournament’s top overall seed. Following the Ramblers is No. 2 seed Drake University with Southern Illinois University checking in as the No. 3 seed. The Ramblers completed a roller-coaster regular season March 2 with an 81-68 victory over Bradley University in front of a sold-out Gentile Arena. The victory gave them their 19th victory so far this season. The team had 25 wins at the end of the regular season last year. Despite suffering through inconsistency all year — including six non-conference losses — the Ramblers have managed to head into the conference tournament with the league’s No. 1 seed for the second year in a row, and a share of the regular season title with Drake. 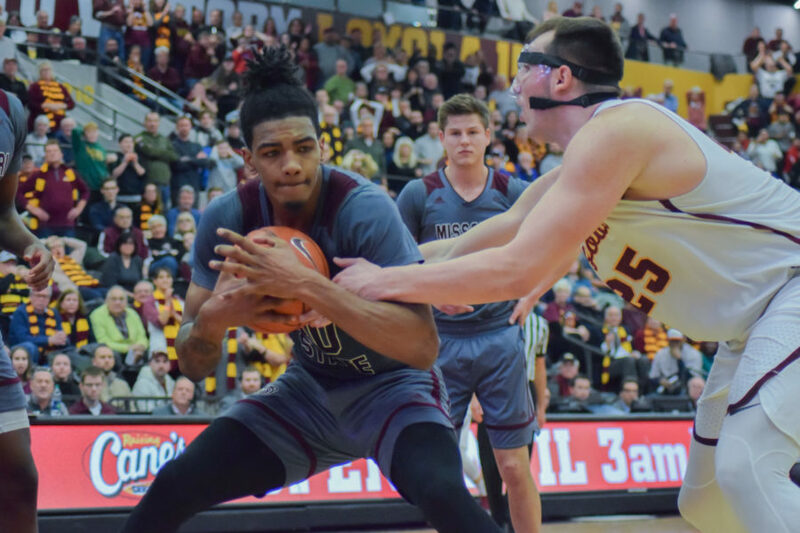 Loyola’s success this season has come on the back of redshirt senior guard and MVC Player of the Year Marques Townes and sophomore center Cameron Krutwig, who combined for 52.4 percent of the Ramblers’ points in conference play. 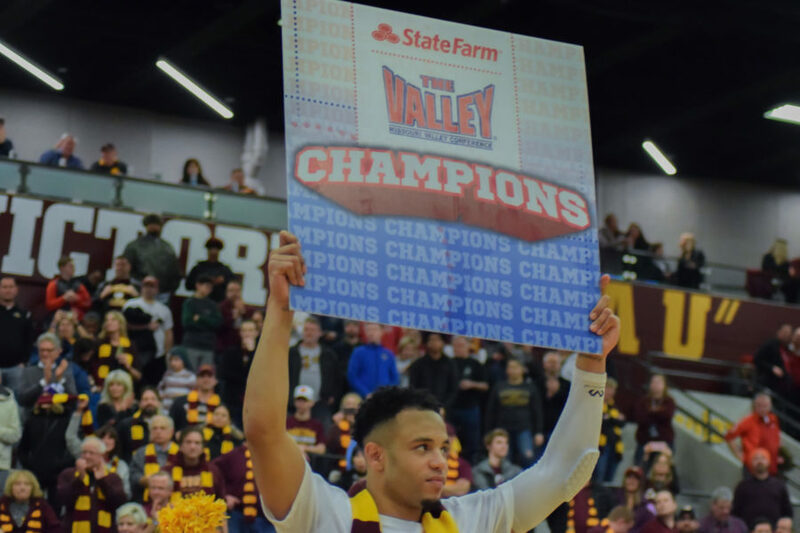 Nick Schultz | The Phoenix Loyola redshirt senior guard Marques Townes celebrates the Ramblers’ second straight MVC title. The duo, along with redshirt senior guard Clayton Custer and sophomore guard Lucas Williamson, bring experience to head coach Porter Moser’s lineup from last year’s Arch Madness. Loyola won three games in three days to secure the program’s first NCAA Tournament experience since 1985 and, eventually, make it to the NCAA Tournament Final Four. Loyola is scheduled to play its first game of the tournament March 8 at noon against the winner of the No. 8 seed Indiana State University vs. No. 9 seed Valparaiso University game, which is scheduled to take place March 7 at 6 p.m. Despite being picked to finish ninth in the MVC preseason poll and losing redshirt senior guard Nick Norton to a torn ACL at the beginning of conference play, Drake finished 12-6 in MVC action — good enough for a share of the regular season title and the No. 2 seed at Arch Madness. The Bulldogs are led by senior forward and MVC Player of the Year runner-up Nick McGlynn, who finished conference play averaging 15.4 points and 9.3 rebounds per game. McGlynn is one of four Bulldogs who averaged double figures. March 4, it was announced the Bulldogs would be without MVC All-Freshman Team guard D.J. Wilkins for the remainder of the season after he suffered a broken bone in his left ankle in their season finale against Missouri State University, proving to be yet another setback for the team this season. 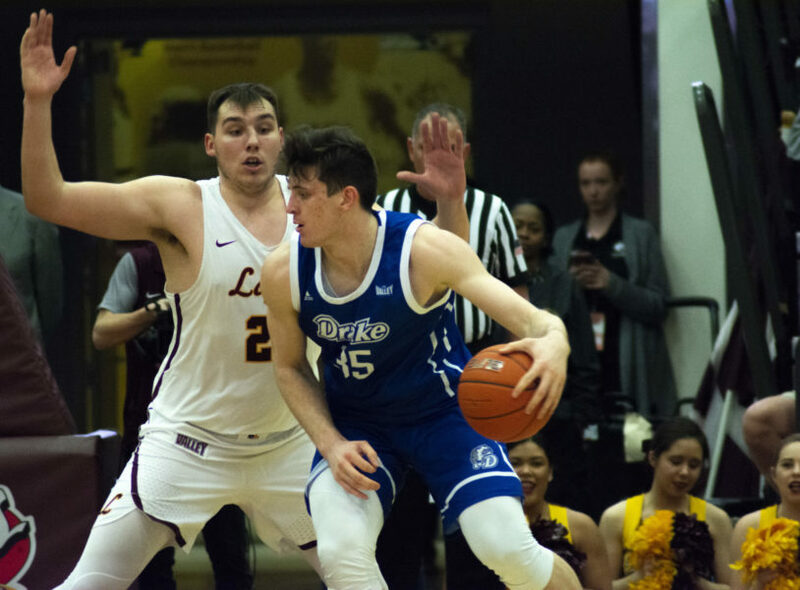 Alanna Demetrius | The Phoenix Loyola sophomore center Cameron Krutwig defends Drake forward Nick McGlynn. The tournament’s No. 3 seed, Southern Illinois, finished the season with a 10-8 conference record and a 1-1 season split with Loyola. Rounding out the tournament’s top four is the Missouri State, which is led by MVC Newcomer of the Year, forward Tulio Da Silva. Starting conference play at 2-4, the Bears rattled off seven wins in eight games — including a season sweep of Loyola in that stretch. Despite this hot midseason run, the Bears dropped three of their last four to fall out of regular season title contention and stumbled into the No. 4 seed. Bears head coach Dana Ford said, despite the late struggles, he thinks his team will rise to the occasion in St. Louis. Nick Schultz | The Phoenix Missouri State forward Tulio Da Silva (left) is one player to watch as Arch Madness approaches. The Bulldogs are scheduled to open tournament play March 8 at 6 p.m. against the winner of the No. 7 seed Illinois State University vs. No. 10 seed University of Evansville matchup, which is scheduled for March 7 at 8:30 p.m.
Southern Illinois and Missouri State are also scheduled to open Arch Madness March 8 with the Salukis taking on No. 6 seed University of Northern Iowa at 8:30 p.m. and the Bears taking on No. 5 seed Bradley University at 2:30 p.m.